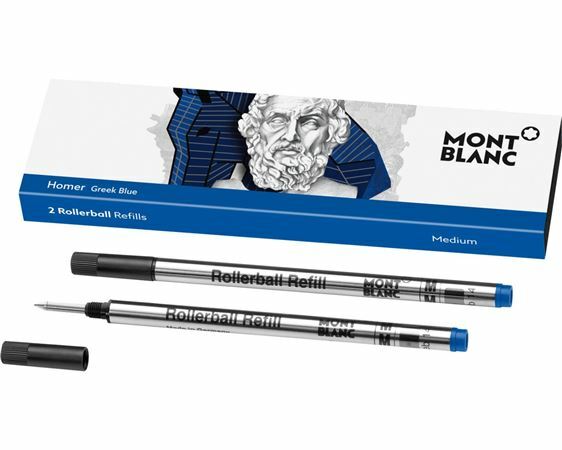 Order your Montblanc Writers Edition Homer Rollerball Refill 2/pk today from FahrneysPens.com. Fine Pens, Refills & Luxurious Gifts – great prices & fast shipping. The Rollerball Refills are linked to the launch of "Writers Edition, Homer". The design is inspired by the Homer sculpture and by the epic poem of the Odyssey featuring the Trojan horse. The color of the cover, ink and refills is inspired by the typical Greek blue color of houses and of the sea. This refill does not fit in the Homer rollerball pen it only fits the Classique size Montblanc pens.